Alonso Krangle LLP, a national law firm focused on protecting the rights of victims, are currently evaluating unpaid wage lawsuits on behalf of employees illegally deprived of compensation in violation of the federal Fair Labor Standards Act (FLSA). Refusing to pay an employee for time spent on site donning and doffing uniforms, or otherwise preparing for work. Refusing to pay employee for time spent attending mandatory meetings, orientation, or training sessions. Deducting expenses for uniforms, other equipment from an employee’s pay. Alonso Krangle LLP offers free, no obligation, and completely confidential legal consultations to all employees who were illegally denied earned wages in violation of the FLSA. To discuss your potential wage violation lawsuit, please contact us today at 1-800-403-6191 or visit our website, http://www.FightForVictims.com. No other work is concurrently performed during the activity. Alonso Krangle LLP is currently offering free, no obligation, and completely confidential legal consultations to any workers who believe they were denied rightfully earned wages in violation of the FLSA. To discuss your potential npaid wage lawsuit, please contact us at 1-800-403-6191 or visit our website, http://www.FightForVictims.com. 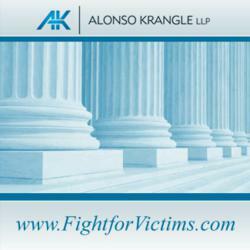 Andres Alonso and David Krangle, attorneys with almost 40 years of collective legal experience, have focused their law practice on the handling of significant personal injury cases, defective drug and medical device litigation, construction site accidents, nursing home abuse, medical negligence, qui tam/whistleblower actions and consumer fraud cases. A national law firm representing injured victims throughout the U.S., Alonso Krangle LLP is headquartered in Long Island, New York, with offices in New York City, and plans to open additional locations in New Jersey.